A common element to a test strategy or master test plan is to include a description of how the project will mature the software system towards release, and how the project team can be sure that progress is on track and of quality. One aspect of that description is to set expectations around entry/exit criteria and/or suspension/resumption conditions, aka “quality gates”. Defining these as quality gates or “hand-offs” at strategic points in the project lifecycle allows the stakeholders involved to check on these expectations and therefore, check on the progress of the project overall. The first and perhaps most important of these expectations are the criteria under which the project will be considered to be done or considered a success. (User) Acceptance Testing is generally used to check or verify a predefined set of acceptance criteria from the Business Users and other stakeholders. Other places in which it is very useful to have clear expectations are at the points where information or work product is provided or handed over by one stakeholder group to another. For example, providing requirements from BA’s to Developers and Testers, or code builds from Developers to Testers and/or Business Users. In these cases, having predefined expectations to the form and quality of the information or work product for the purpose that it is being handed over will ensure smoother communication between the groups resulting in greater efficiency and collaboration. 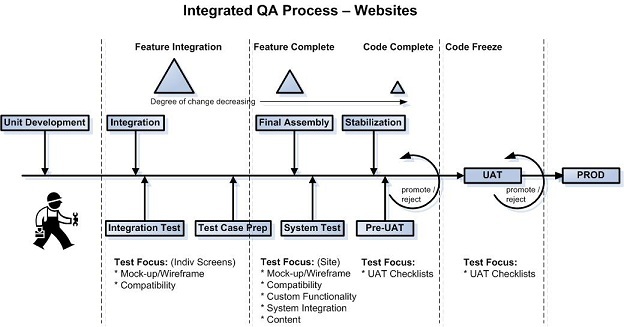 The following sample diagram from a process put in place to manage the testing of a large number of websites developed by a variety of 3rd party developers every month illustrates some of the expectations/quality gates that were agreed to between the project stakeholders. Such quality gates and their expectations facilitated tracing issue root cause and examining which preventative measures failed or need to be enhanced so as to be able to continue to lower costs associated with poor quality. This entry was posted in All, Planning for Quality, Test Planning & Strategy and tagged acceptance testing, quality gates, software testing. Bookmark the permalink.